Picea breweriana, first described in 1885 by Sereno Watson (1826–1892), in Proceedings of the American Academy of Arts and Sciences, 20th edition. 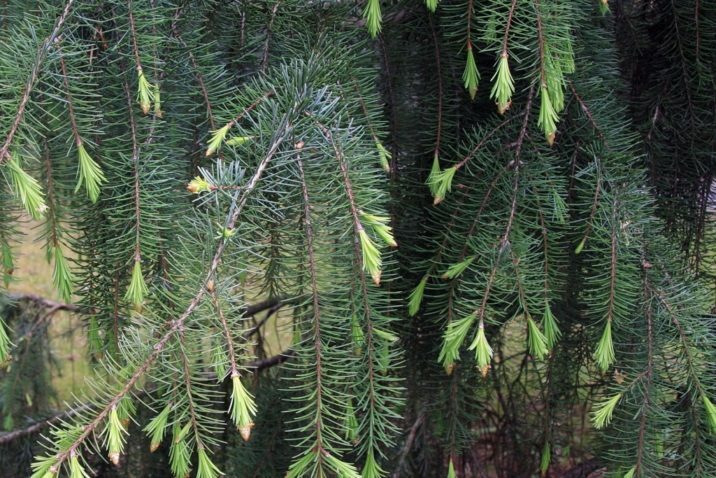 It is commonly known as Brewer or weeping spruce. The species name honors William Henry Brewer (1828 - 1910), who was a botanist for the California Geological Survey when he collected the first botanical specimen in 1863 on the flanks of Mount Shasta, California. Description. 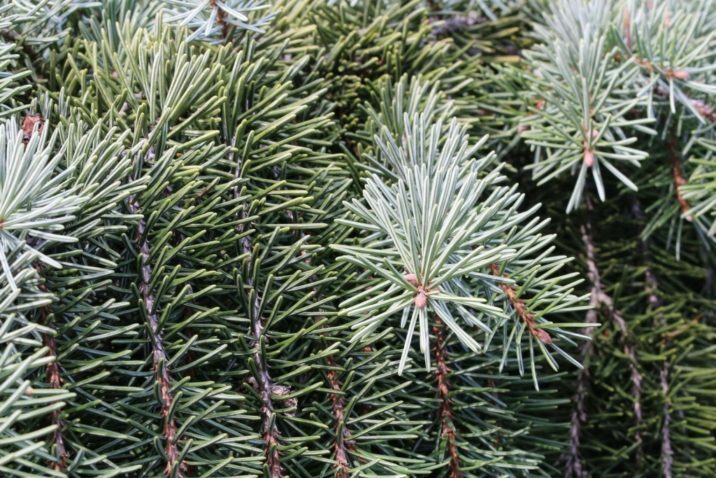 Brewer's spruce is an evergreen coniferous species of tree that grows to mature heights of 125 feet (40 m) with a typically buttressed trunk up to 60 inches (150 cm) diameter, measured at breast height; and a conic crown. 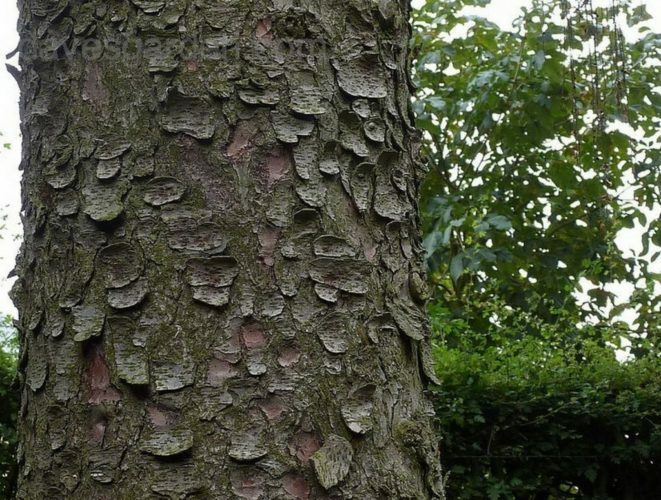 Bark is gray to brown. Branches are drooping; with strictly pendant, slender, elongated, lightly pubescent, gray-brown twigs. Foliar buds are gray-brown in color, measuring 0.2 to 0.28 inch (5 - 7 mm) long with a rounded apex. 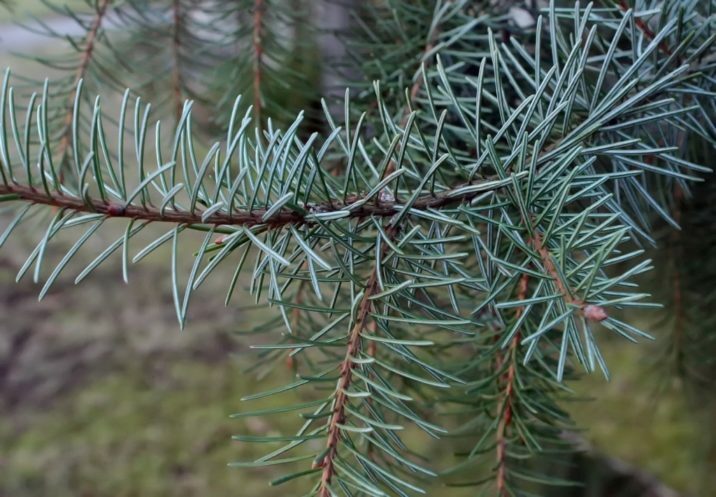 Leaves (needles) measure 0.6 to 1.2 inches (1.5 - 3 cm), flattened or broadly triangular in cross section. Abaxial surfaces are rounded tor slightly angular, and the rather rigid, abaxial surface is dark, Blue-green, absent of stomatal bands. Adaxial surfaces are glaucous with conspicuous stomatal bands separated by slight ridge or angle. Needles bear blunt apices (especially on older leaves). Pollen cones measure 0.8 to 1 inch (20 - 25 mm) long and brown in color. Seed cones are dark red-purple when young, ripening red-brown, and are cylindrical in shape, measuring 2.6 to 4.8 inches (6.5 - 12 cm) long. Seed scales are fan-shaped, measuring 0.6 to 0.8 inch long and wide, with and entire to slightly erose margin at the apex. 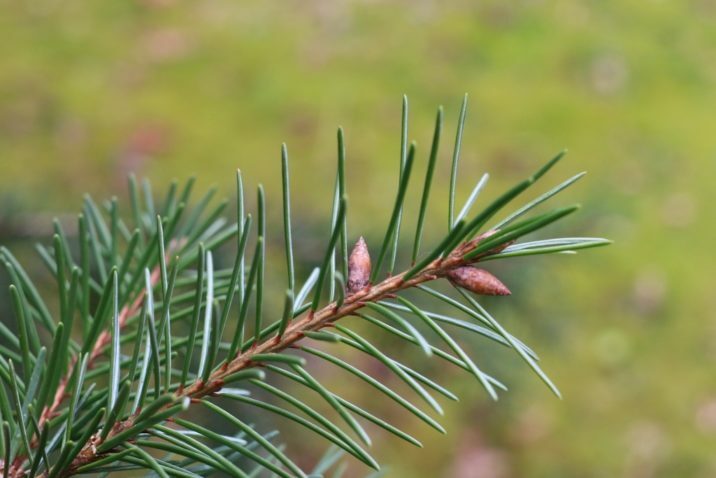 Needles radiate all about the pendulous shoots, and are somewhat flattened down onto level shoots; pendulous shoots tend to have longer leaves (0.8 to 1.2 inches / 2 - 3 cm) than those on level shoots (0.6 to 1 inches / 1.5 - 2.5 cm). Young trees do not show pendulous branchlets until about 10 to 20 years old, and until then are open with level shoots and shorter leaves; they can be confused with Picea omorika at this age. Distribution. This species is native to USA — southwestern Oregon and northwestern California growing at elevations of 3,200 to 7,500 feet (1,000 - 2,300 m) above sea level in montane to subalpine forests of the Siskiyou Mountains. The species is distributed from 13 to 45 miles (22 - 145 km) from the Pacific coast, in scattered populations, of which the northernmost, at Iron Mountain, is disjunct by 18 miles (29 km). 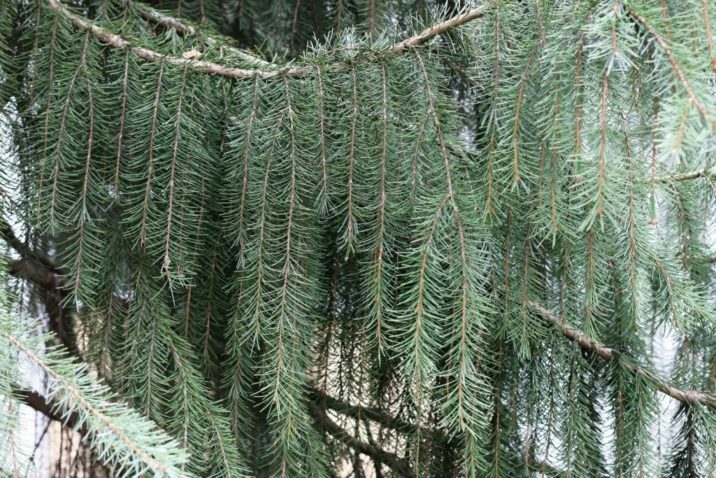 Michael Frankis notes, Picea breweriana's natural range provides for "an oceanic climate that is usually not associated with cold, dry, desiccating winds that are often found in continental areas." Hardy to USDA Zone 6 — cold hardiness limit between -10°F and 0°F (-23.2° and -17.8°C). 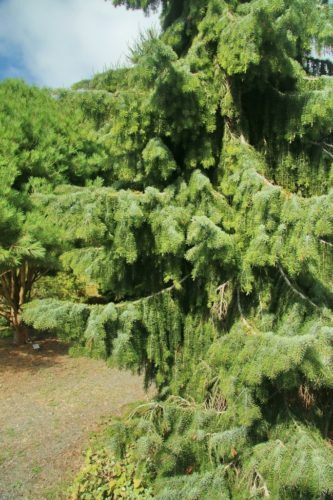 Attribution from: Ronald J. Taylor; Sections on Picea and Tsuga: Flora of North America Editorial Committee (editors); Flora of North America North of Mexico, Vol. 2. ©1993, Oxford University Press. 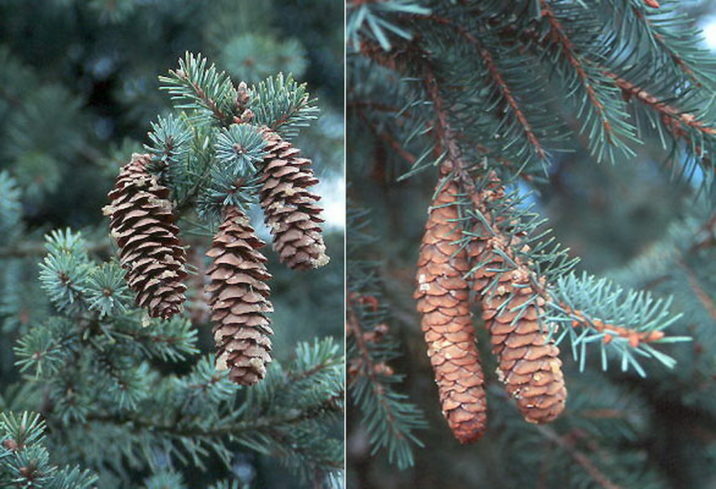 Picea breweriana — young seed cone and foliage detail in early spring. 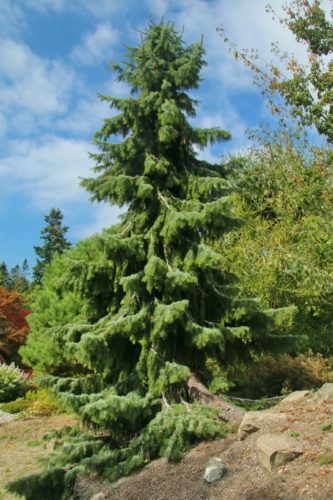 Picea breweriana — mature tree at the UBC Botanical Garden, Vancouver, B.C., Canada. Branches are drooping, with vertically pendulous branchlets forming curtains of foliage. 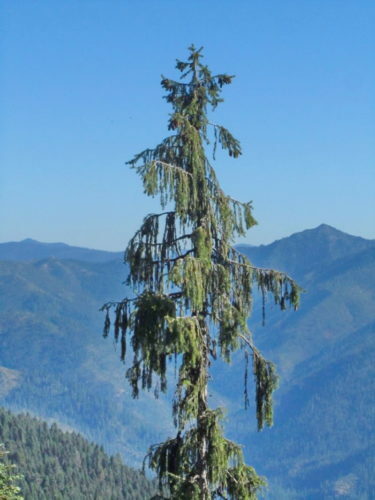 Picea breweriana — Brewer spruce on ridge above Bear Lake, in the Siskiyou Mountains, Northwestern California. Does anybody have information on the cultivar 'Gravel Truck'? Hi Louise ... the full name appears to be 'Gravel Truck Compact.' 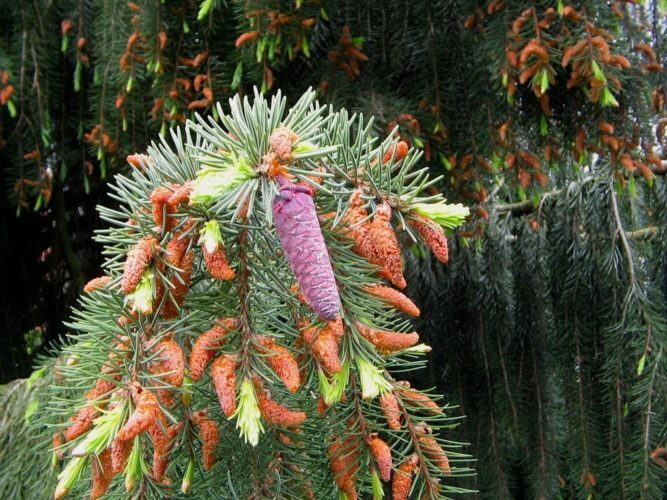 It appears to be really new; selected and introduced by Jason Hupp at Western Evergreen Nursery, Silverton, Oregon. It's so new that no pictures or descriptions are available anywhere. I'll reach out to Jason to see what I can find out. That is what I knew. Who found it as a broom or is it a seedling? Where was it found? What is the annual growth rate? How did it get that name? And any other interesting tidbits. Thank you.